What happened to Tracy after she got stranded? Find out today. 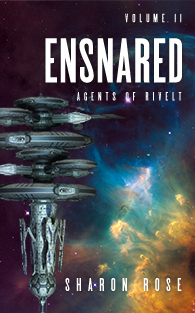 As promised, I’m releasing Ensnared early. This is the concluding short story in the Agents of Rivelt series. I’ve loved writing every story in this series, but this one is my personal favorite. It’s just so much fun to write plot twists and, well, I’d better not spoil it for you. Here’s the official description. I would love to hear what you think of these stories. Please comment below or post a review.